The Best Hair Brush Straighteners: Do they really work? Home / Combs & Brushes • Flat Irons / The Best Hair Brush Straighteners: Do they really work? When a video of the DAFNI hair brush was first launched in 2015, it quickly went viral. 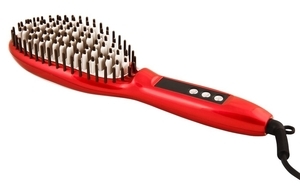 The brush, which was manufactured by an Italian company, is touted as the first-ever hair straightening ceramic brush. 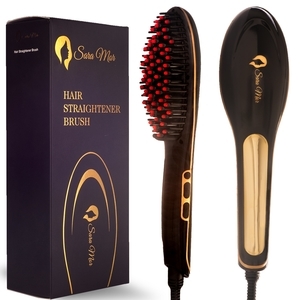 We also consider it as the best straightening brush despite its expensive price. It has a very simple concept really. You use it as a straightening tool while also brushing your hair to a smoother texture, glossier shine, and better body. 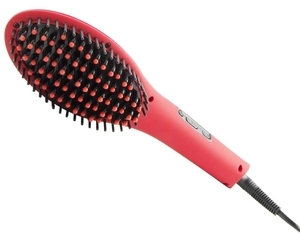 You slowly run the hot ceramic brush through your hair resulting in the removal of kinks, knots, and waves. Your hair will also be rid of unwanted frizz and fuzz. 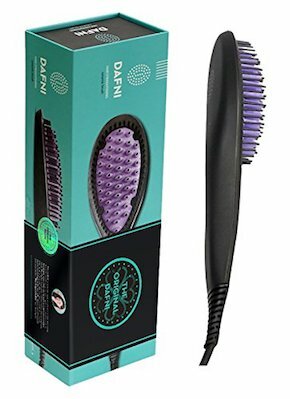 >> Check out the DAFNI – our top recommended brush straightener! But the DAFNI hair brush is not the only option available. 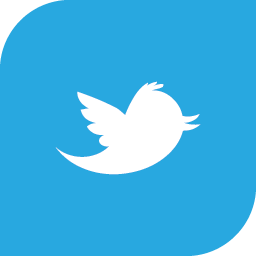 If you’re looking to buy one, this guide is for you. Ceramic plates are still the best material because these produce radiate gentle heat to the hairs’ inner shafts resulting in even heat distribution. Your strands will also not get burned (i.e., no hot spots), and will come out feeling soft and looking shiny. Solid ceramic plates are preferred by hair professionals because of their remarkably smooth surface area. You can smoothly glide the brush flat iron along the sections of hair – no catching in the kinks and knots. Your hair will also be free from damage since ceramic plates aren’t usually prone to high heat requirements. Keep in mind that not all hair is created equal so your heat requirements may be different from the person next to you. So get a brush that has variable heat settings that can be adjusted based on the type, thickness, and condition of the hair. Emphasis must be made that healthy hair may be able to withstand higher temperatures. But color-treated, permed, and damaged hair will require a straightener with lower temperature, so variable heat settings is a must. Thick and coarse hair, in contrast, will require higher temperatures so that its thick cuticles can be smoothed out. A good straightening hair brush has a large surface area, which makes it easier and faster to straighten several sections of hair within minutes. You will want this product, too, instead of the traditional flat iron because it has seven times the surface area. You can straighten thick hair in half the time! But you may want to avoid extra-large straightening brushes as these can also be unwieldy when used. A regular-sized brush is your best bet in this instance. You should also consider features like anti-winding power cord with sufficient length; safety plug for leakage and short-circuit protection; and auto key lock. You may even pay more for accessories like gloves and hairclips for better hair straightening jobs. The cost of the straightening brushes should also be compared especially as these products are more expensive than flat irons. 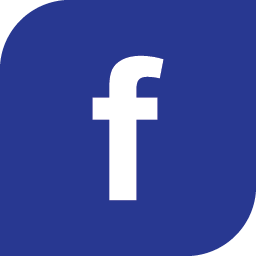 Be warned that with many cheaper alternatives, you may be tempted to purchase one of these products – don’t! You have to remember that price equals quality when it comes to these innovative products, so invest in the best to enjoy the best value for your money. You have likely heard about hair straightening brush because of DAFNI, the original ceramic brush of its kind. Since it has a larger surface area than a flat iron, up to eight times, you can achieve a salon-quality blow-out within 5 minutes. The temperature stays at the optimum 365˚F so your hair shouldn’t be burned to a crisp when it’s used properly. You will love its quick heating mechanism, too – just plug it in, push the “on” button, and wait for under a minute. You can use it when the green light goes on. The button is also placed within easy reach but not too near as to be accidentally turned off. Your hair can be straightened quickly, too, even if you have wavy or curly hair. You mustn’t over-straighten your hair lest you end up with broomstick strands. You may want more volume in your straightened hair so bend over before brushing up and out. The bristles have a special coating that ensures your hair will not be sticking to the brush. Your hair will not end up tangled, unlike in other electric-heated brushes. You don’t have to section your hair either since the brush can be used like a regular brush. The biggest issue: It’s expensive price tag. But since you’re paying for quality, the price becomes moot. You’re likely baffled by the company’s marketing slant about the Infiniti Pro having diamond infused ceramic plates combined with ionic technology. But look beyond the jargon and you will see that the proper use of the ceramic plates results in shinier, smoother, and straighter hair! Your curly or wavy hair will be straighter within a few passes of the smoothing hair brush. Just keep in mind that the thicker, coarser, or curlier your hair, the more passes with the brush it will require for a great blow-out. 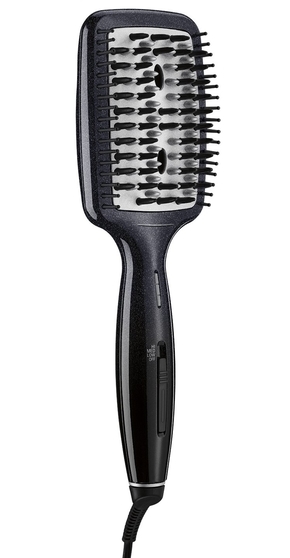 The paddle brush allows for more contact with the strands so faster styling can be achieved. The bristles are made from a combination of nylon, silicone, and ceramics, which contributes to better manageability of your hair. The ionic generator removes frizz, which means added smoothness and shine to your hair. This is a great feature during hot and humid days when frizz and fuzz are more likely to appear. You have three settings to choose from, which means the Infiniti Pro is suitable for all hair types. The highest heat setting is 400˚F, which should be sufficient for thicker or coarser hair. Other features include instant heat-up (i.e., under a minute after turning it on) and swivel-style cord for convenient use, even on your own. 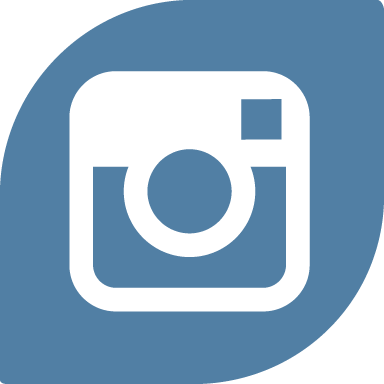 The cord, however, may be on the short end for many users. 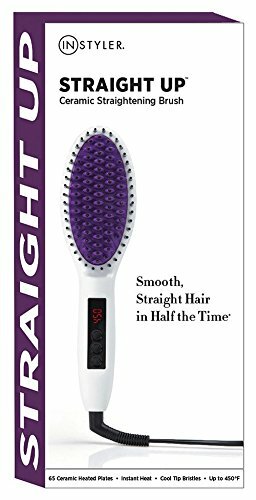 You will like the more affordable price of the Apalus Hair Straightening Brush without sacrificing on the important features of efficacy, safety, and convenience. The ceramic plates are longer by about 25% in comparison with many other straightening brushes. You will then be able to cover the strands of hair from roots to tips, which means better results. Your hair can also be treated to an oil treatment in combination with the brush resulting in improved appearance, even for frizzy and dry hair. The device has a built-in temperature control feature. Your hair will be subjected to an even temperature ranging from 120˚F to 140˚F in the comb case resulting in safe use. You can also rely on its fast heat-up mechanism – a minute to attain 180˚F and three minutes for 450˚F, the highest temperature setting. The power switch will be locked within five seconds when you turn it on, which means no accidental turning it off. You can unlock the switch and turn the device off by double-clicking on it. If you’re having trouble using the centigrade and Fahrenheit functions, you just have to use the conversion feature with its plus and minus buttons. 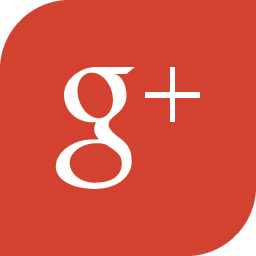 You may even be able to customize your heat settings according to your desired results. Other benefits include 360˚ anti-winding power cord, safety plug, and free accessories including gloves and hair clips. 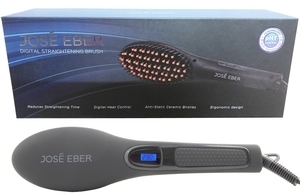 You can now solve your hair issues, such as wavy, curly, flyaway, and frizzy hair, with the Jose Eber Digital Straightening Brush, guaranteed. You have the assurance, too, of ease of use since it’s like using a handheld hairbrush – or a flat iron and hairbrush in one. You can’t go wrong with the digital temperature display. Just set the right heat setting for your hair type – check the instructions manual – and the temperature will be displayed instantly. You can go higher and lower in temperature depending on your desired results. The brush itself has anti-static ceramic bristles with silicone tips, a feature that results in more manageability and less frizz for your hair. You can use it for all hair types from fine and thin to thick and coarse, and from wavy to straight by changing the heat settings. The bristles will work well for all hair types. The heat generated by the ceramic bristles also seals in the heat in the cuticles resulting in an attractive luster, regardless of your hair color. You can even use it on permed, color-treated, and damaged hair without adding unnecessary stress to the delicate strands. Other features include dual voltage (110v/220v) for domestic and international use as well as lifetime manufacturer’s warranty. But it may not look as stylish as the other brushes, a common observation among users. Your hair straightening sessions will be easier and faster with the InStyler Ceramic Straightening Brush. The 65 ceramic plates quickly heat up, usually in under a minute, yet maintain the selected heat setting throughout the session. You have the assurance that your hair will be subjected to even heating. You can actually straighten and smoothen as many sections of your hair in a single pass, which means a faster job. The brush surface not only heats up quickly, it also cools down quickly for safety purposes. You have seven heat settings from the lowest at 330°F to the highest at 450°F with the selected temperature displayed on the LED display. With cool tip bristles designed to reduce frizziness, you can use it even in hot and humid conditions. You can style as close to the roots as possible without injuring your scalp. Its smooth surface makes it easy to glide over your hair. Your hair should come out smoother and softer than ever with each pass of the brush. Safety features include a swivel cord and auto shut-off. This is also a relatively lightweight brush so your arms will not get quickly tired although the larger brush can be an issue for a few people. 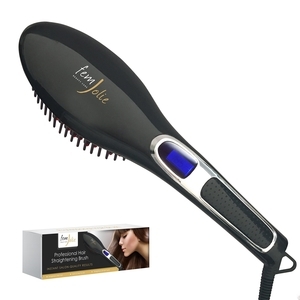 You will get four products in one device with the FemJolie Electric Hair Straightener Brush. You have a hair brush, a detangling comb, an anion hair massager, and a hair straightener, the perfect hair styling device for your home or for traveling. The brush has a fast-heating ceramic plate so that you can use it in under a minute after plugging and switching it on. You can straighten even tangled hair in several sections in one or two passes of the brush, a great improvement over the labor-intensive use of a flat iron. Your arms and hands will also appreciate the non-grip comfort handle and the 360° swiveling power cord. But you shouldn’t be using it for more than 30 minutes at a time even for thick hair because multiple sections can be straightened at a time. The device also uses negative ionic charge coupled with silicone heat-proof brush tips to ensure little to no damage to your hair. You can even enjoy a good scalp massage from the anion head massager while your hair gets the best treatment. You can also customize the temperature settings according to your hair type. It also comes with a money-back guarantee and 12-month warranty. You can use the Thairapy 365 Digital Straightening Brush for all hair types, which means possible income opportunities. You can straighten hair faster and easier since the device combines the benefits of a traditional hairbrush and a straightening device. You don’t have to use a brush in one hand and a flat iron in the other hand for this reason. The brush offers several heat settings with each setting shown on the digital temperature display. You can apply lower or higher heat depending on your hair type, too – higher for thicker hair, lower for finer hair. You can even change the heat settings for certain hair sections. 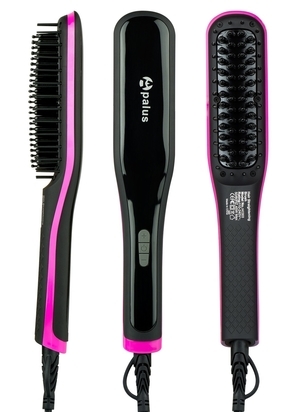 Your hair will gently slide between the silicone-tipped, anti-static ceramic bristles. With each pass, your hair will become straighter, smoother and shinier, even acquire more body. Your stubborn hair with its frizz and fuzz will be replaced by great hair in under 30 minutes, a boon in your busy life. The device can be used here and abroad, thanks to its 100V/240V dual voltage. You also have the assurance of a limited lifetime warranty. You will appreciate the sturdy build of the Sara Mor Hair Straightener Brush, as it’s constructed with durability in mind. Built using high-quality materials, the brush was engineered to withstand high temperatures. Your hands will not be burned since its handle doesn’t heat up. Your scalp and hair will not be injured, too, thanks to the anti-scald feature. Your hair will not be damaged by the constant pull of a flat iron either – just use the brush like a regular brush while watching your hair become straighter and sleeker. The silicone-insulated tips of the brush are responsible for the double benefits of comfort for your scalp and straightening for your hair. You don’t even have to worry about tangling your hair in the brush because it does all the work. 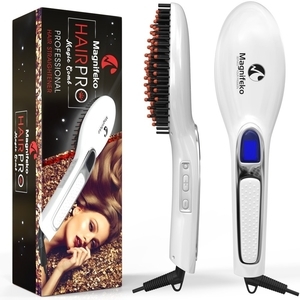 The device warms up to the desired heat setting in under five minutes, which is longer than other straightener brushes. It also comes with a carry bag (for travel), a brush (for cleaning), and 2 hair clips. It also comes with a one-year product warranty for your peace of mind. Why get a handheld brush and a flat iron when you can get a 2-in-1 device? The ISA Professional Digital Brush Straightener combines the two products without the learning curve. Just place several sections of your hair onto the brush, gently pull it downwards, and make another pass at it for straighter hair. You may also use the device for making beachy waves and glam curls with a few flicks of your wrist. The 100% titanium ceramic plate on the brush head gently yet firmly passes through your hair, regardless of its tangled condition. You can choose the right temperature depending on your hair’s condition with your selected setting shown on the neon background LCD display. The 30-minute automatic shut-off safety feature ensures that it will not overheat, in case you forget to turn it off. The 360-degree swiveling cord makes it easy to style hair even when you’re bending over. Add in the full 2-year warranty and it’s a must-have for women who love styling their hair straight. You have a straightening brush, a detangling comb, and a hair massager in one easy-to-use device. Your hair will easily and quickly become smoother, shinier, and straighter with several passes of the ceramic brush, all within 30 minutes or less. Each pass can hold as many as 10 sections of hair, which means a faster job. The special comb on the brush will untangle the knots without damaging your hair (i.e., pulling it). You can even enjoy a light scalp massage, which will contribute to healthy-looking hair by releasing natural oils. You can use the device in under a minute because it quickly heats up without overheating, which can damage your strands. The ergonomic handle coupled with the device’s light weight makes it easy to use, even for small hands. You will not accidentally change the temperature settings, too, because of the silicone keys on the handle, which will require sufficient pressure to click. If you’re looking for a brush that straightens hair, you can choose from any of the abovementioned products. You will find that every one of these hair straighteners will do the job of straightening your hair while also making it look smoother and softer. Pick the one that suits your specific budget, safety and convenience features, and overall design preferences.